It was an exciting day in April 1856 when a young, 32 year old, German botanist named Heinrich Gustav Reichenbach received an orchid flower from his friend Herr Decter. The flower was aCattleya mossiae but, unlike the typical C. mossiae, which was lavender in color or occasionally white, this flower had white sepals and petals but, surprisingly, a lavender-colored lip. Although tens of thousands of C. mossiae plants had been imported into Europe over the previous 20 years, nothing like this had been seen before. It was not a white, albino flower and it was not a typical lavender flower. It was something of both and it was awesome. The cattleya flower was so unusual that Reichenbach wrote a description of it which was published in the 1856 issue of the botanical magazine,Bonplandia (item 76). He named the flower after Decter’s orchid grower, Herr Reinecke, and called it Cattleya mossiae “Reineckeana.” The flower was soon the talk of the orchid world and would become one of the most sought after orchid plants of all-time. As time went on, the name “Reineckiana” became synonymous with any Cattleya mossiae having white sepals and petals and a lavender lip and a plant like the famous stud used by H. Patterson & Sons and Thomas Young Nurseries in the 1940s and 50s called “Cattleya mossiae reineckiana Young’s variety,” is still only known by that name. As more and more large-flowered Cattleya species were discovered over the next 50 years in the jungles of South America, horticulturists found that this unique color combination was not exclusive to Cattleya mossiae. Although the varieties were extremely rare, amazingly, all the large-flowered species had a plant or two with white sepals and petals and a lavender lip. It was a basic color-form of the lavender large-flowered cattleya species whether they grew in Venezuela, Colombia or thousands of miles away in Brazil. Only the yellow species, C. dowiana, C. tenebrosa and C. grandis did not have this color form. As the first hybrids using these plants began flowering, botanists found another fascinating fact about the white-with-colored-lip combination. The color was genetically specific. In other words, both parents of a hybrid had to have white sepals and petals and lavender lip genes to produce that color in the offspring. 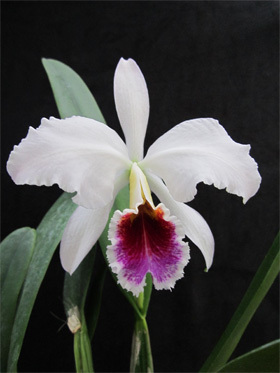 The description, “white-with-colored-lip,’ of course, which was used for over l00 years by orchid hobbyists, commercial growers and botanists, is a little long and somewhat awkward to say, so everyone heaved a sign of relief when Dr. Gustav Melquist in the late 1950s suggested we call them “semialbas”. The name was so simple and straight forward that it soon became the only way to describe these flowers and that is the way we describe them today. There were a number of famous semialba varieties of the Cattleyaspecies found in the jungles of South America during the first 100 years of orchid collecting. Two of the most well known are Cattleya mossiae reineckinana ‘Young’s variety’ (found in the 1930s) and C. warscewiczii ‘Frau Melanie Beyrodt’ (usually abbreviated F.M.B.) FCC/RHS 1904. These two plants were used as studs to produce the beautiful Cattleya Enid semialba made by H. Patterson & Sons during the 1940s. Despite being a primary cross, Patterson’s Cattleya Enid produced nicely shaped semialba flowers on tall spikes and the plants were vigorous growers. Two of these plants were so fine they actually received FCC’s from the American Orchid Society – ‘Orchidhaven’ and ‘Rainier.’ Patterson remade the C. Enid cross a number of times using the same parents both for cut-flower and plant sales because it produced such excellent results. Another famous semialba species is Cattleya trianaei ‘Trenton’ which has a remarkable dark purple labellum and was also widely used for breeding. Cattleya schroederae ‘The Baron’ FCC/RHS (1908), is another rare and expensive variety, which is probably the finest semialba C. schroederae ever found. 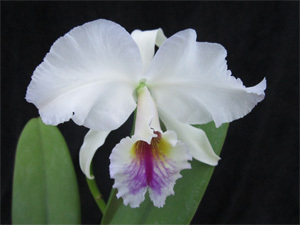 Other famous varieties include the old favorites Cattleya labiata ‘Cooksoniae’ FCC/RHS (1895) and ‘Mrs. E. Ashworth’ FCC/RHS (1896). These semialbas were such treasured plants that they survived the last century very well and can still be found in private collections and occasionally appear in listings from commercial growers. The semialba is without doubt one of the most popular colors in cattleya flowers. It has been rapturously described as “the most regal of all cattleyas” by its admirers. 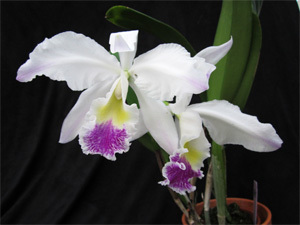 The semialba form of Lc Canhamiana (now Cattleya Canhamiana) was the June wedding orchid of the cut-flower era of the 1930s – 60s and is the most popular orchid hybrid of all time. 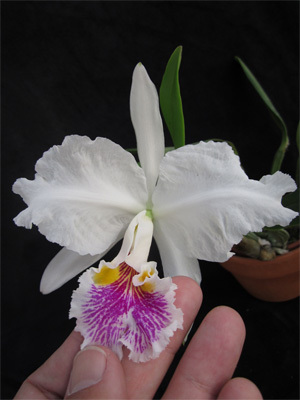 It was made, of course, from a semialba Cattleya purpurata from Brazil and a semialba Cattleya mossiae from Venezuela – in most cases using C. mossiaereineckiana ‘Young’s variety’. When the Rod McLellan Company in 1953 decided to name an orchid for First Lady Mamie Eisenhower, they chose a semialba cattleya they called “Laeliocattleya Mamie Eisenhower ( Lc Chevalier x Lc Britannia) which was stunning. To keep the political climate balanced, Lines Orchids in 1961 named a beautiful semialba cattleya for former First Lady Bess Truman and most First Ladies after that have had semialba cattleyas named in their honor. With virtually all the large-flowered Cattleya species to work with, hybridists have produced semialba cattleya flowers for every season of the year so people can enjoy them all the time. Many of the hybrids have been meristemmed and can be bought at reasonable prices. Since literally hundreds of fine varieties of semialba hybrids have appeared over the years, it is not possible to include them in this article. To show the high quality that exists today in semialba hybrids, however, I have pictured a few of my favorites. *A special thanks to Venice Bayrd of Longwood Gardens for her help with the historical references in this article.